After sleeping on the same pillows for over 15 years, no strike that....I had at least one of those pillows in College which was 1988-1992 for the undergrad...So let's generously say say 20 Years. The same pillows that I am not entirely sure Where they came from, but I am certain that if I DID buy them, they didn't cost over ten bucks. Some I am sure I stole from various lodging establishments that really couldn't be called "Hotels". 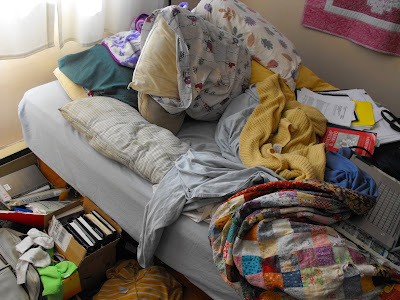 Place this mess of motley pillows on a pillowtop mattress that Terrance bought when I was pregnant with Emily. A Mattress that came mysteriously one day while I was at work. A Mattress which, at best, was most likely a "Factory second". 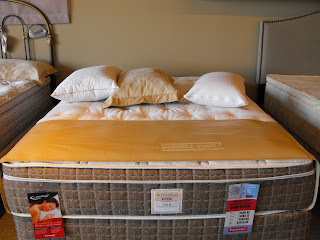 A Mattress with no box spring, but was a step up from the futon we were sleeping on in 1997. A Mattress which, 13 years later, has craters indented into my side of the bed...which, after flipping, turning and changing means there are 4 craters, Two per side. Place this mattress on a couple pieces of particle board that has been improvised as a "frame" for 13 years. Now, mix in a person who LOVES to be in Bed. I mean really, really LOVES it. As in, to quote my best friend, "If you could rule the world from your bed, you would be the happiest person in the world". Do you see that nest? This was at the end of the writing....the stacks of books, the unseen stacks of paper coffee cups overflowing in the trash. I am a human Crow, stealing shiny bits and string to decorate my environs. Add in the two free roam rabbits and frankly Terrance doesn't even try to live in this part of the house. He "visits" with me...then heads to his bed in the other room for the night. We think this has helped to extend our marriage, this giving up of space, since he isn't breathing loudly in my ear and I am not flopping all over, bumping him. Two hours spent in the store, testing different models. Then pillows. Testing pillows on the chosen bed. The 4 pillows I bought ( why Yes, I do need FOUR pillows ) are heaven. Yes, at 200 bucks for the four, they were the most expensive pillows I have ever bought in my life. I could hardly look at the receipt for shame. But Oh. The difference already! The bed gets delivered on Wednesday, and I can hardly wait. I may have to write an ode to my new bed to express my joy at its wonderfulness. And to you I say, Spend the money on yourself. Sure, it will make you sweat as you consider that this money could be paying bills, or sending your kid to camp for the summer, or a million other things - like your tuition. However, the money I will save on seeing the chiropractor because my mattress is killing me combined with the sheer happiness I will experience by laying on these pillows in that bed is worth it. Two or three years ago we spent our tax refund on a queen pillowtop and new pillows. Can't think of the last time I we made such a wise investment. I have repeatedly said that the money we invested in a good mattress 10 years ago was the best money we ever spent. It's starting to get to the point where it's not absolutely awesome to lay down on, but it's still miles better than the cheap crap we had before we bought it. Investing in your sleep pays off in a million health benefits, not the least of those is your mental health. Woman, there are things about you I have not yet imagined. But I'm totally with you on the bed. I fell in love with a man who had the most comfortable bed I (after a marriage of sleeping on principle,on futons) had EVER experienced.